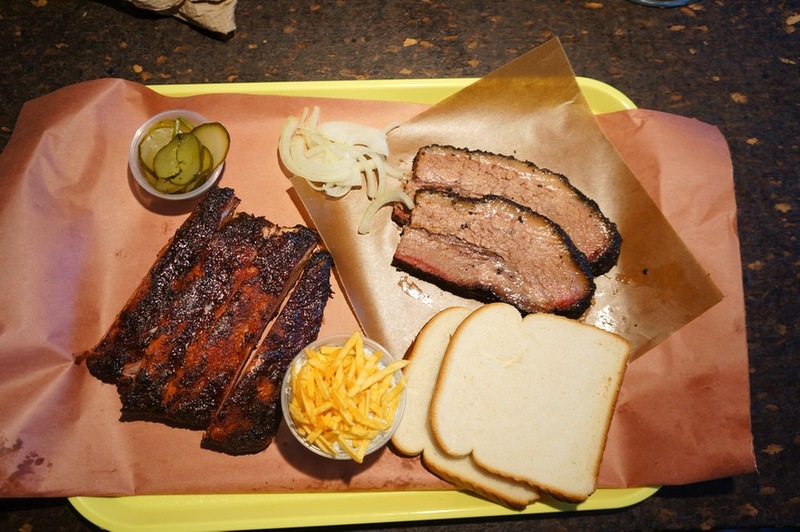 To Mike’s delight, BBQ joints have been popping up all over the city. 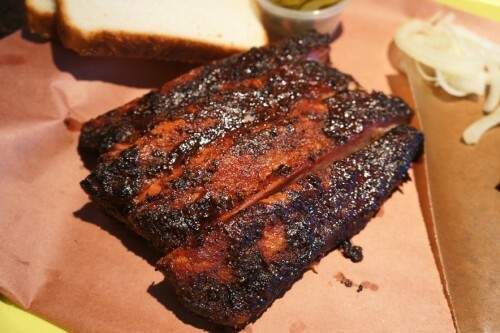 I have to admit, I rarely crave BBQ so we haven’t tried too many of them. 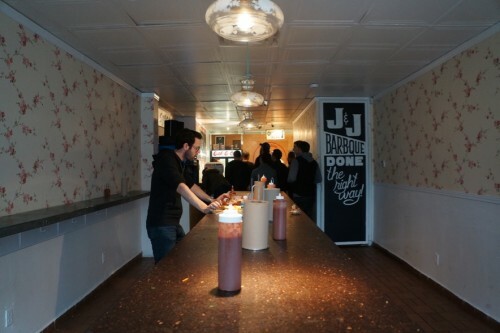 But Mike’s been pretty persistent so I finally gave in and we dropped by J&J Bar-b-que one Saturday afternoon. On a side note, don’t you find that everything comes to Toronto in waves? 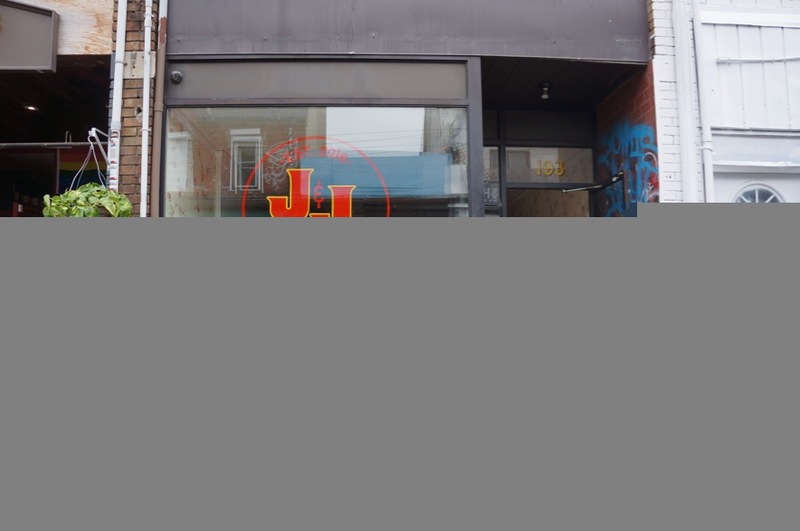 There was a time when ramen joints were popping up left right and centre and now it’s all about poke and BBQ (Adamson BBQ, Cherry Street BBQ and Smoke Signals to name a few). 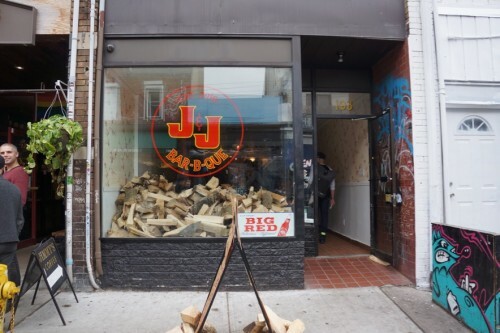 This BBQ joint opened up in Kensington Market over the summer on the busy stretch of Baldwin. The space, which was previously home to Thomas Lavers, is long and narrow with a long high-top communal table down the middle of the space for eat-in customers. There are no stools or chairs though – it’s standing room only. The interior – standing room only. J&J is brought to us by Jay Moore and Jon Lucas who both come from a fine dining background which might make you think that these guys really don’t have a clue when it comes to Texas-style BBQ. That was my initial thought, at least. But I thought wrong. You’ll find their menu offerings on a chalkboard next to the cashier. Most offerings are priced per pound: brisket ($28), turkey ($24), spare ribs ($18), pork belly ($18), turkey ($24) and beef ribs ($32). In addition to the proteins on their own, you can order them in the form of a sandwich. Order a selection of items and they’ll put it together for you on a tray. 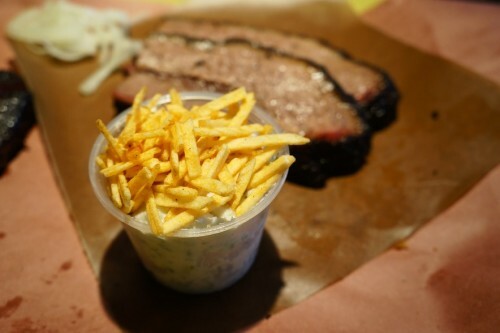 Sides include the standard offerings you’d expect from a BBQ joint including potato salad, macaroni salad, coleslaw, cornbread and pinto beans. They open at noon from Tuesdays to Sundays and close whenever they sell out. So, don’t be surprised if you arrive later in the afternoon to find that some items are done for the day. You can’t come to a BBQ joint without trying their Brisket ($14/half pound). We asked for two slices since Mike didn’t want to share. 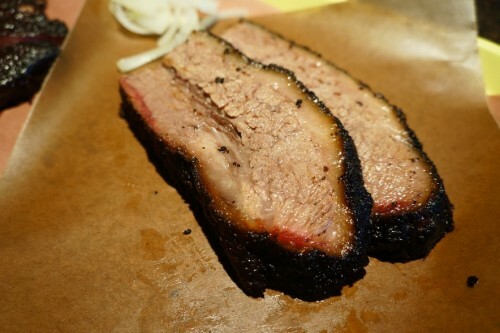 Honestly, brisket is pretty hit or miss for me since it can so often be unbearably dry and devoid of any flavour. This definitely wasn’t the case here. The fatty brisket, which arrived glistening on our tray, was tender and so decadent. The smokiness wasn’t very intense and didn’t overpower the meat at all. They are all about simple rubs here, which for the most part consists of just salt and pepper. It’s always so eye-opening when a simple salt and pepper rub can create something so delicious. The brisket was extremely rich so I ended up eating it with some complimentary white bread, pickles and onions to cut the richness. And for those who like it saucy, there are squeeze bottles of BBQ sauce on the communal table to use to your liking. We also ordered some Pork Side Ribs which were the highlight of the meal. These aren’t fall-off-the-bone kinda ribs. Rather, they have a meaty texture to them and have a nice chew. They aren’t of the saucy variety either (if you want it saucy, just add some bbq sauce to your tray). I didn’t find that they needed much sauce since they had so much flavour on their own. To supplement on the meat, we ordered a side of Potato Salad which we both enjoyed. I loved the abundance of dill in it and the sprinkling of Hickory Sticks on top added a nice crunch. 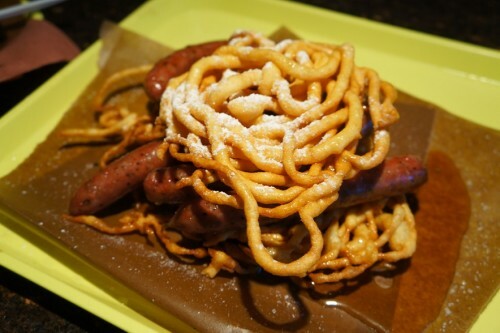 The last item we shared was the Maple Links with Funnel Cake ($8). I initially wanted some hot guts sausages but the customer in front of us ordered the last few. One of the owners overheard me voicing my disappointment to Mike and convinced us to order this instead. It might sound like an odd pairing but when you think about it, it’s really along the same lines as a sweet and savoury chicken and waffles combination. They brought it out to us as we were finishing up the brisket and ribs as the funnel cake took some time to make. When it arrived, I was shocked at how large it was. It consisted of five links sandwiched between two large funnel cakes. After getting used to the idea of paying nearly $20 for a funnel cake and a bottle of water at Wonderland, this $8 dish is a real steal! We enjoyed the links which had a nice balance of sweet and savoury. They paired well with the funnel cake which had a mix of super crispy bits and softer doughier parts in the middle. Our total bill came out to around $45 and had more than enough food. After the links and funnel cake, we both had major food coma and barely needed to eat the rest of the day. We had a great meal and wouldn’t hesitate to come back. I have to admit, it’s got me craving for more BBQ!